With an annual capacity of 2.4 million tonnes per year through its operating subsidiaries Dubai Aluminium (Dubal) and Emirates Aluminium (Emal), Emirates Global Aluminium (EGA) not only ranks among the world’s top five primary aluminium producers, but also places the UAE as the fourth largest aluminium producing country in the world. Having shipped approximately 88.5 per cent of its 2014 production of high quality, high performance products to over 350 customers in almost 70 countries across the globe – predominantly in Asia, Europe, the Middle East North Africa region, and the Americas – EGA is a significant contributor to the UAE economy through international trade. The business also represents a key sector in the successful strategy, implemented since the 1970s, to diversify the national economy away from dependence on oil and gas. Two of the UAE’s largest ports – Jebel Ali Port, Dubai and Khalifa Port, Abu Dhabi – have played an integral role in the successful export operations of Dubal and Emal, as well as the imports of raw materials for the smelters’ manufacturing processes, since inception. 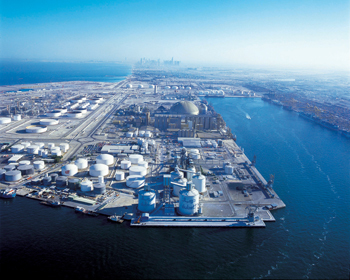 At Dubal (also known as EGA Jebel Ali), the relationship with Jebel Ali Port spans more than 35 years. The company’s roots stem back to May 5, 1975, when the late H H Sheikh Rashid bin Saeed Al Maktoum signed a decree establishing Dubal as a joint-venture company. The smelter complex would be built on a 475-hectare site near Jebel Ali village, 35 km south-west of Dubai alongside the then two-lane highway to Abu Dhabi. Construction began in May 1976, culminating in the first cell being energised in November 1979 and the first metal being exported in January 1980. The development of Dubal coincided with the construction of Jebel Ali Port – then the largest man-made harbour in the world, where Dubal would have its own dedicated port facilities. Today, Dubal operates one of the world’s largest smelters, with 1,573 reduction cells producing in approximately 1.04 million tonnes of molten aluminium per year. 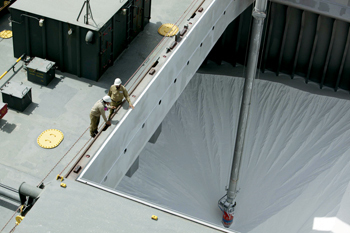 The operation has two dedicated berths at Jebel Ali Port plus storage facilities for 310,000 tonnes of alumina; 50,000 tonnes of calcined petroleum coke; and 30,000 tonnes of liquid pitch at Jebel Ali Port. The latter caters for the carbon plants at both Dubal and Emal. Emal (also known as EGA Al Taweelah) is the anchor tenant of Khalifa Industrial Zone Abu Dhabi (Kizad), and an integral component of the Kizad Aluminium Cluster. Similar to Dubal, Emal has a purpose-built berth at Khalifa Port plus storage facilities for 210,000 tonnes of alumina; and 50,000 tonnes of calcined petroleum coke. In another parallel, the development of Khalifa Port was simultaneous to the construction of Emal, where Phase I of the two-phased project began in 2007; the first cell was energised in December 2009; and the first shipment of alumina at Khalifa Port arrived in November 2010. Ranked among the largest industrial projects in the UAE outside the oil and gas sector, the completion of the Phase II expansion project mid-2014 has positioned Emal as the largest primary aluminium smelter in the western world. The smelter’s 1,200 reduction cells have the capacity to produce more than 1.35 million tonnes of molten aluminium per year. The complete commissioning of Emal boosted the total volume of products exported by EGA in 2014 (some 2.04 million tonnes) by 23 per cent higher compared to 2013. This phenomenal growth in business was managed with aplomb by the two ports, confirming the value-added by the UAE’s ports to the local aluminium industry. Moreover, the mutual success arising from EGA’s traditional partnership approach to business was evidenced by EGA receiving the 2014 ‘Best Importer and Exporter’ award in the Abu Dhabi Ports Company (ADPC) Customer Awards; as well as the ‘Exporter of the Year’ award at the 7th E-Services Excellence Awards (ESEA), which were organised by Dubai Trade – a subsidiary of Dubai World.